If you are using the Mac systerm, you can get Pavtube BDMagic for Mac, and the steps are same with the Windows version. From "File" drop-down menu, select "Load Disc" to import Blu-ray disc from the optical drive. Click “Format” bar, and select 3D side by side .mp4 from “3D” . This format also is supported 3D VR headsets, you can read how to watch 3D on VR headsets. Step 3. 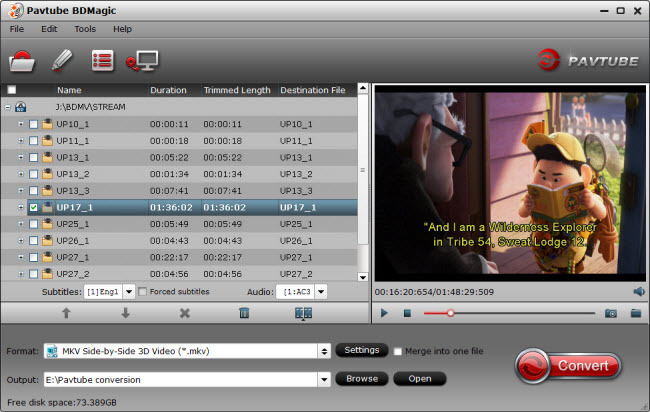 Click the “Start conversion” button on the main interface and the software will start to convert 3d movies to Kindle Fire (7) friendly 3d side by side mp4 formats immediately. When the conversion finishes, click “Open” to find the converted video files. Then you can effortless transfer the video files to Kindle Fire (7) supported 3D video player for playback on the go nicely.